The most common scenario where the #VALUE! 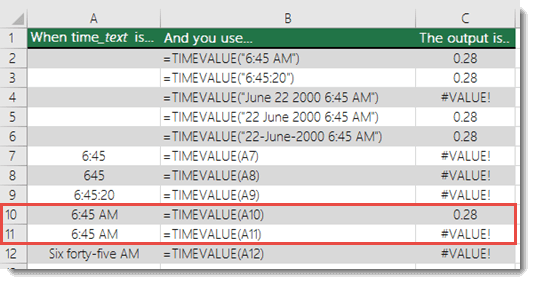 error occurs in TIMEVALUE is when the time_text argument contains a value other than a text string. Note: Date information in time_text is ignored. Solution: You have to change to the correct value. Right-click on the cell and click Format and make sure the cell follows the Text format. And if the value already contains a text, make sure it is valid. Looking at this example, you might wonder why C10 works, but C11 doesn’t. It’s because C10 is formatted as Text, while C11 is formatted as Time.